Item #46002 Klingon Bird of Prey Halodome $74.95 ea. In Stock These 1995 Lighted musical Star Globe halodmes are still in the original boxes,this Klingon BOP is the third in a series of three Star Globes,this lighted halodome features two Klingon Birds of Prey uncloaking & readying themselves for battle. The globe`s dynamic artwork creates a spectacular background for these powerful ships, & an electronic chip enhances the scene with Klingon warriors shouting orders in their unique language,requires 3 AAA batteries (NOT included). Item #48058 Star Trek-TNG U.S.S. Enterprise D 7th. Anniversary Musical Star Halodome $69.95 ea. 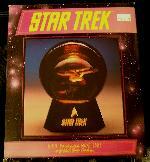 In Stock (ONLY HAVE 2) These Willits Star Trek TNG U.S.S. Enterprise NCC-1701-D musical star Halodome, is near mint, in a near mint box, this is a spectacular lighted, piece has been created to commemorate seven yrs. of Star Trek TNG, a superb reproduction of the Enterprise D, hovers in a light-filled dome before a brillantly painted scene from space. A electronic micro sound chip plays the theme music from the original sound track as the voice of Patrick Stewart speaks the famous words from each start of every NG episode, the dome rests on a silver-grey base on which appears a special commemorative medallion, was produced in 1994. Item #47051 Classic U.S.S. Enterprise Star Globe $74.95 ea. This exclusive limited production star globe features an authentic scale model reproduction of the U.S.S. Enterprise NCC-1701 as seen in Star Trek,the U.S.S. Enterprise star globe is the first of three limited production edition from Willitts Designs,each limited to 12 months of production. Four alternating lights shine a dramtic wash of mulicolored lights into the 110 mm glass globe filled with iridescent glitter,the removable hood creates an exciting space enviroment & enhances the globe`s lighting & design,the attractive black base features the official Star Trek emblem & logo in handsome gold lettering,an on-off switch is included on the underside of the base,takes 3 AAA batteries(NOT included). Item #50498A-SET Johnny Lightning- Legends of Star Trek Set of 4 Die-Cast Ships Series 5 $24.95 a set of 4 (SOLD IN SETS ONLY) In Stock These Johnny Lightning Legends of Star Trek set of 4 die-cast ships include 1 of each of the following, Enterprise NCC-1701 Battle Damaged as seen in Star Trek III-The Search for Spock, Enterprise NX-01 with Exclusive photos included, Classic Klingon D-7 Battlecruiser torpedoes & explosions included & Galileo II shuttlecraft NCC-1701/7 all ships are about 4" long, very detailed, die-cast display stand, near mint and come in near mint clam shell packaging. Item #48057 Star Trek The Next Generation 7th. Anniversary Porcelain Plaque $74.95 ea. In September of 1987, Star Trek TNG began its voyage into TV history. In 1994,the voyage reaches its end. To commemorate 7 yrs. of this grouind-breaking TV series,Willitts Designs is proud to present this beautifully illustrated plaque. Adorning its fine porcelain surface are portraits of the show`s characters,as unique and exciting as the show itself,and the Starship Enterprise. The elegant plaque is outlined with delicate white gold edge,and is enclosed in a handsome silver-grey wood display case,featuring a special edition medallion. The display case is equipped with a built-in easel and hook for either shelf or wall display,measures about 10 1/2" wide by 10" tall,all plaques are mint and all boxes are near mint. Item #50498B-SET Johnny Lightning Star Trek Die-Cast Ships of the Line Series 6 set of 4 Ships $34.95 a set of 4 (SOLD IN SETS ONLY) In Stock These Johnny Lightning Star Trek ships are mint in near mint clam shell packaging, in each set you get Borg Cube with phaser explosions, U.S.S. Yamota NCC-71807 with detachable saucer section, U.S.S. Excalibur NCC-1664 and Romulan D-7 Battlecruiser each ship comes with a die-cast display stand and each ship is about 4".